Fire in California’s Ecosystems describes fire in detail—both as an integral natural process in the California landscape and as a growing threat to urban and suburban developments in the state. 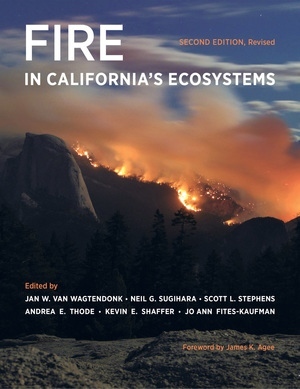 Written by many of the foremost authorities on the subject, this comprehensive volume is an ideal authoritative reference tool and the foremost synthesis of knowledge on the science, ecology, and management of fire in California. Part One introduces the basics of fire ecology, including overviews of historical fires, vegetation, climate, weather, fire as a physical and ecological process, and fire regimes, and reviews the interactions between fire and the physical, plant, and animal components of the environment. Part Two explores the history and ecology of fire in each of California's nine bioregions. Part Three examines fire management in California during Native American and post-Euro-American settlement and also current issues related to fire policy such as fuel management, watershed management, air quality, invasive plant species, at-risk species, climate change, social dynamics, and the future of fire management. This edition includes critical scientific and management updates and four new chapters on fire weather, fire regimes, climate change, and social dynamics. Jan W. van Wagtendonk is Research Forester Emeritus with the National Park Service, Yosemite National Park. Neil G. Sugihara is Program Coordinator, Wildfire Training and Education, at Northern Arizona University. Scott L. Stephens is Professor of Fire Science, Department of Environmental Science, Policy, and Management, at the University of California, Berkeley. Andrea E. Thode is Professor of Fire Ecology and Management, School of Forestry, at Northern Arizona University. Kevin E. Shaffer is Fisheries Chief at the California Department of Fish and Wildlife. Jo Ann Fites-Kaufman is a private consultant. KEVIN E. SHAFFER, SHAULA J. HEDWALL, AND WILLIAM F. LAUDENSLAYER, JR.